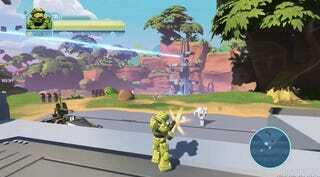 It seems that Master Chief almost ended up blasting Covenant made of Mega Bloks. After showing the Diddy Kong racing sequel that never was and a scrapped sequel to Oni, archivist Andrew Borman is now reporting on the prototype for Mega Bloks Halo in a new video on his YouTube channel. Borman reports that the prototype, codenamed ‘Haggar’, was developed by nSpace. Players could run around to fight Covenant, drive customizable vehicles, and use bloks to build turrets and other pieces of the environment. The project would have also featured a co-op mode and a siege mode. The full development history of the project is unclear given its highly confidential nature but Borman speculates that the 360 title was abandoned as Microsoft made plans for the launch of the Xbox One. You can learn more by watching the video above.